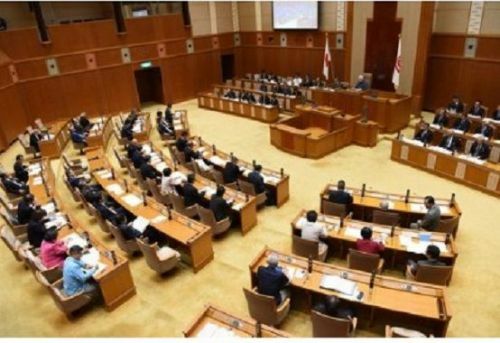 In response to a recent incident in which a piece of Osprey fuselage dropped to the ground, on February 21 the Prefectural Assembly adopted a written statement and protest resolution requesting the immediate closure of Futenma Air Station. On February 21, the Okinawa Prefectural Assembly unanimously adopted a written statement and protest resolution requesting the immediate closure of Futenma Air Station. These were adopted in response to a Futenma Air Station MV-22 transport Osprey’s engine intake cowling that dropped to the ground on February 8. The Assembly pointed out that the repeated U.S. military aircraft accidents constitute extremely unusual circumstances. Furthermore, the Assembly stated that airborne training exercises continue while there are no signs of improvement to the U.S. military’s safety management systems. It asserted that it absolutely cannot approve of the U.S. military’s contemptuous attitude toward Okinawans, and that the voices calling for the withdrawal of the Marines from Okinawa are becoming louder. Moreover, the Assembly severely criticized the U.S. and Japanese governments, reminding them that Okinawa is not a colony. In response to aircraft based at Futenma Air Station repeatedly experiencing trouble and emergency landings, on February 1 the Prefectural Assembly adopted a resolution calling for the immediate closure of Futenma Air Station and the relocation of the U.S. Marine Corps out of Okinawa or even out of Japan. This more recent protest resolution in response to the Osprey fuselage piece dropping to the ground asks for, (1) a thorough inspection into the cause of the accident and a public announcement regarding the results, (2) a halt to flights and training involving aircraft based at Futenma Air Station over private land, (3) the immediate closure of Futenma Air Station, and (4) a drastic revision of the U.S.-Japan Status of Forces Agreement. The U.S. Marines in Okinawa did not report the fallen aircraft part until the Okinawa Defense Bureau made an inquiry about it. This protest resolution states that the lack of notification from U.S. military to the Japanese government about the accident calls into question whether there was intent to conceal the incident. The protest resolution is addressed to Prime Minister Shinzo Abe and the U.S. Ambassador to Japan William Hagerty, among others.